The new Ambassador to the Royal Kingdom of Saudi Arabia to Ghana H. E. Meshal Hamdan AL Rogi has assured the chairman of the National Hajj Board Sheikh I C Quaye that under his leadership the Saudi Embassy shall provide all the necessary support towards a successful 2019 Hajj. The Ambassador gave the assurance when the Chairman of the Hajj Board Sheikh I C Quaye and his delegation paid a courtesy call on him at the Embassy of the Royal Kingdom of Saudi Arabia to welcome a him on his appointment. The Ambassador emphasizes the importance attached to Hajj by the King and the heir apparent as well as the Saudi Kingdom at large as the custodians of the two holy mosques in Mecca and Medina. As custodians they have the responsibility to receive all pilgrims as the guests of Allah as stated in the Holy Qur’an. The care and comfort of pilgrims is therefore of outmost importance to them. On Ghana, the Ambassador expressed his contentment and admiration with the progress of the nation since his last duty a decade ago. 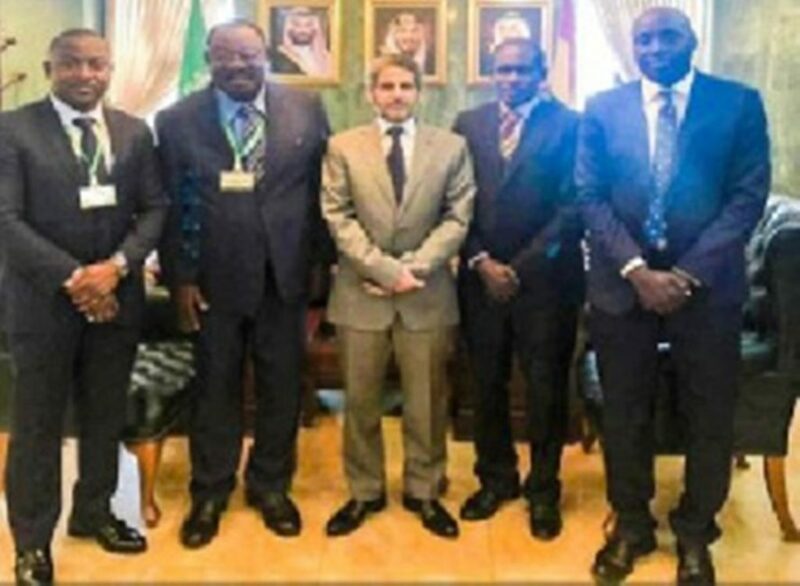 He promised to work very hard to improve the good relationship between the Government and peoples of Ghana and the Royal Kingdom of Saudi Arabia. He could not hide his admiration of the positive energy of His Excellency the President of the Republic of Ghana Nana Addo Dankwah Akufo Addo and his Vice Alhaji Dr. Mahamadu Bawumia. The strides being made in the country did not also elude him and called for all hands-on deck to push these developments forward. On his part Sheikh I C Quaye briefed the Ambassador on the performance and successes chalked by the Hajj Board under the NPP government and required of him to be supportive as usual. He recalled the excellent relationship between the embassy on one hand, the Kufuor government and the Hajj board on the other and hoped that his coming back will further strengthened and deepened the relationship with the Akufo Addo government for the mutual benefit of our peoples. Sheikh I C Quaye offered an open hand of assistance to the ambassador anytime he needs him. This was replicated by the ambassador. He then appealed to him to open his doors and listen to all shades of opinions and interact favourably with the Muslim Ummah. Sheikh I C Quaye wished him and his family a happy stay in Ghana and used the opportunity to thank the staff of the Royal Saudi Embassy for their annual support to the Hajj board and Ghanaian pilgrims. Meanwhile the National Hajj Board has announced that it has began registration of pilgrims who intend to embark on this year’s Hajj pilgrimage. A statement signed by the Communications Directorate of the Board said that the biometric data collection exercise will take place in Accra, Kumasi and Tamale. It indicated that the Hajj Village and the Aliu Mahama Stadium will serve as registration spots for people in Accra and Tamale respectively whiles that of Kumasi will be announced at a later date.